Q&A: How can I prevent my Kindle e-reader from freezing up on me? Question from Kaileigh: My Kindle e-reader has started freezing up on me. It’ll be working fine and then just stop in its tracks. It won’t let me turn the page or return to the home screen or anything. When this happens the only way to get it working again is to let the battery die so it’ll shut down. How can I stop my Kindle from freezing up on me? Rick’s answer: I’m sorry you’re having trouble with your Kindle device, Kaileigh. These devices are generally quite dependable, but as with any electronic device things can and do go wrong at times. Before I do anything else please allow me to explain how to restart a frozen Kindle without having to let the battery die (which is very bad for the health of the battery). 1 – Press and hold the Power button for one minute. At some point during that time the screen should go black. This is normal and you can simply ignore it. 2 – After one minute has elapsed release the Power button. The device should now power on and boot back up with all of your downloaded content right where you left it. That’s all there is to forcing your Kindle to shut down and reboot with a “Hard Restart”. If your device continues to freeze up on you I recommend that you try performing a “Factory Reset” on it. Important: A factory reset will take your Kindle back to the state it was in when you first bought it. That means you’ll have to set up your Wi-Fi network access and re-enter you Amazon account information. You’ll also need to download all of your content again. This should be no big deal but I thought I should let you know what to expect. 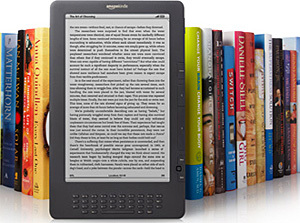 1 – Power up your Kindle and make sure the “Home” screen is displayed. 2 – Tap the Menu icon located at the top right of the Home screen (it looks like three vertical dots). 4 – Tap Device Options. 5 – Tap Reset, then tap Yes to confirm that you really want to reset the device. That’s all there is to it. After the reset procedure is complete your Kindle e-reader should be set back to its factory default settings. If a software issue was causing your device to freeze up it should now be fixed. However, if it continues to freeze up on you after performing the factory reset that means the device probably has a hardware issue that you won’t be able to fix on your end. If so, I recommend that you contact Amazon Customer Service to check on the device’s warranty status and your options for having it repaired. If it turns out the device is no longer under warranty and you don’t believe it makes sense to have it repaired, your only option will be to replace it with a new one. I hope this helps, Kaileigh. Good luck. Bonus tip: This post explains how to automatically save an extra 3% on everything you buy from Amazon.